Post-war liquidation of the last of northern California’s old-growth forests created an intensely competitive market for forest products in the 1950s. To add value to their wood products, hundreds of lumber mills throughout the region turned to the wood preservative pentachlorophenol, known as penta or PCP. For two decades, government oversight of penta use did not exist. Left to their own devices, lumber companies applied the chemical with reckless abandon and little regard for health and environmental consequences. California finally awoke to the problem in 1967, when rain washed penta from a sawmill yard into the Mad River, killing 30,000 fish overnight. Penta was being kept in an open basin at the mill, a common practice in mills throughout the region. Workers would submerge fresh-cut lumber into the tub, then haul it out—dripping penta—to stack in the mill yard. Further investigation by the state and regional water quality and health agencies failed to produce a comprehensive inventory of which mills used the chemical or about effects on workers’ lives. After the premature deaths of several penta workers at the Simpson Timber Company mill in Arcata in the 1980s, the deadly chemical finally was banned for most uses in 1987. 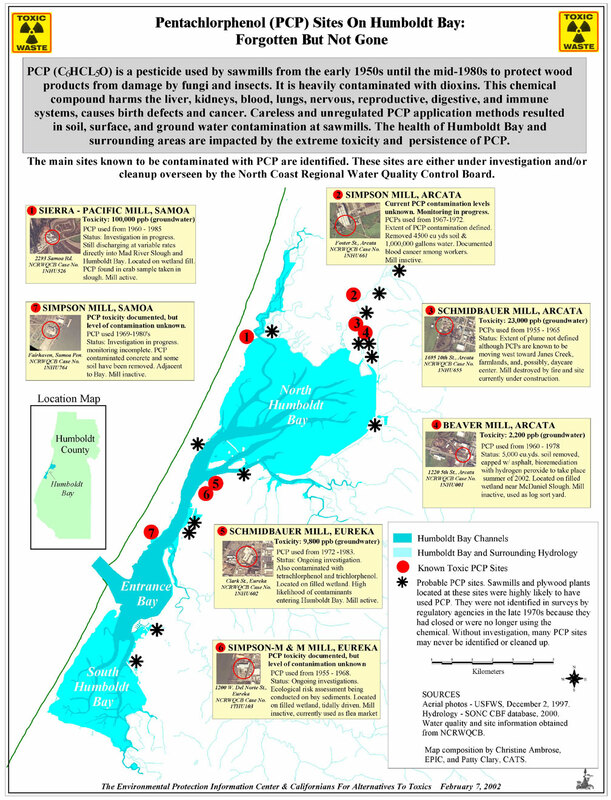 But despite its extreme toxicity, few old sawmill sites have been sampled for contamination by penta or for dioxin, penta’s deadly and lingering companion chemical. Dioxin, particularly 2,3,7,8-TCDD, its most toxic form, is one of the most notorious chemicals in the world. It is created unintentionally as a byproduct of the manufacturing process in the case of pentachlorophenol. Dioxin was recently acknowledged by state water quality regulators to be the toxic legacy of pentachlorophenol use at sawmills. By doing its dirty work within DNA, where it mimics hormones, dioxin profoundly disrupts critical bodily functions. It is internationally recognized as a cause of cancer in humans. At very low doses, dioxin causes irreversible effects in the development of mammals, particularly fetuses. The immune system and reproductive function are targets of dioxin’s toxicity. It accumulates in fatty tissue where it can be stored for years until being released during pregnancy or other times of physical stress.